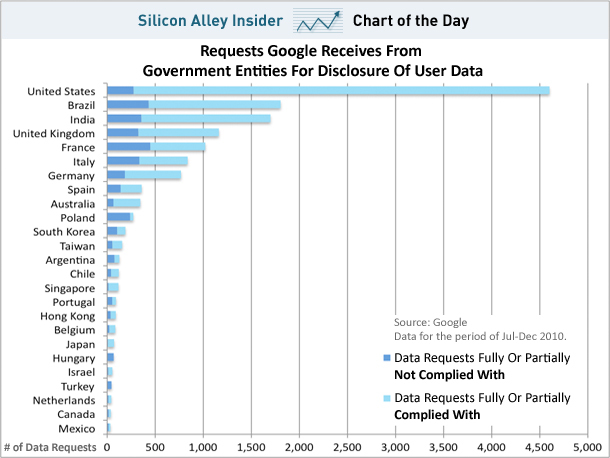 In the second half of 2010 Google received 14,201 user data requests and it complied with 76% of these. Such requests normally relate to criminal investigations. 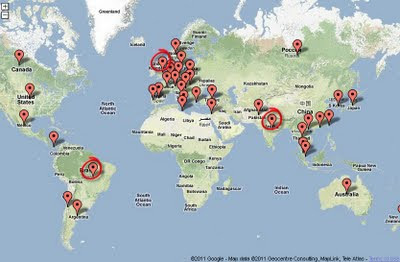 This was nearly a 6% increase on similar requests for the first half of 2010. 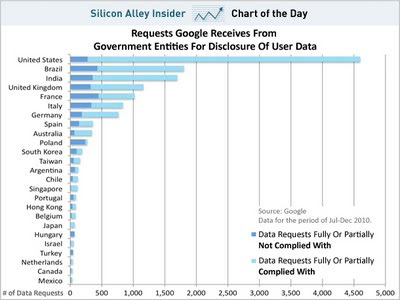 It comes as no surprise to note that the US Government easily topped the list (4,601 requests) and Google obliged by releasing all or some of this information, almost without exception (94% of the time). The statistics demonstrate that a country such as Singapore, often touted as amongst the most controlling in terms of media, made far fewer requests (118 data requests of which 88% were complied with). Brazil, India and the UK also made in excess of 1,000 user data requests during the latter half of 2010. Google also receives requests from governments, the courts and law enforcement to remove content and this is detailed in the Transparency Report. Brazil figured highly largely due to a Fall election period which saw the number of court orders issued from electoral courts rise, ordering removal of content related to political campaigns. In addition, one court ordered removal of more than 11,500 photos from Picasa. The lawsuit alleged that the photos contained images of pages from copyrighted books. 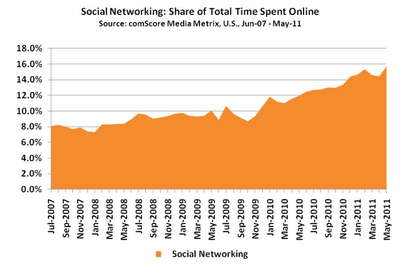 Social networking use has doubled since 2007. 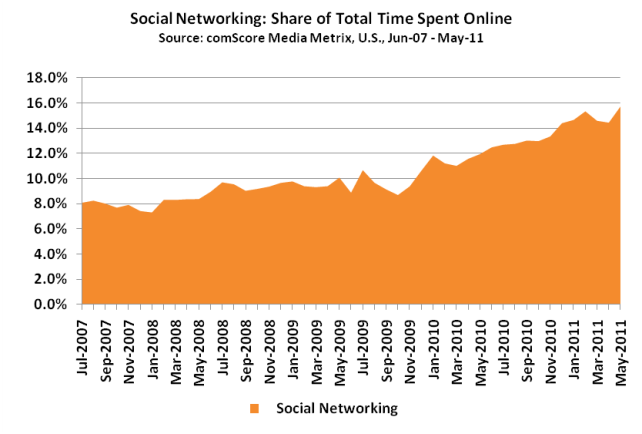 Non-social sites are fighting a losing battle when it comes to online user preference. As this chart clearly demonstrates Facebook is not just growing in addition to the rest of the Web, it is actually taking patronage away from other sites and growing at the rest of the web's expense. "the 'document Web,' based on how Google and other Web architectures view its pages as documents, linked together. But increasingly, it might as well be called the “searchable Web” since it’s accessed predominantly as a reference, and navigated primarily via search". Instead of the searchable web we now have a fully connected digital life. "Now, the Web knows who we are (identity), is with us at all times wherever we go (mobile), threads our relationships with others (social), and delivers meaningful experiences beyond just text and graphics (video)." The implications of this quantum shift for publishers of content are profound. The old searchable web as we knew it is struggling, while the new, connected social web is sweeping all before it. Facebook is the new docking station for our human interaction as Search Engine Optimistion (SEO) a la Google is becoming increasingly less relevant. 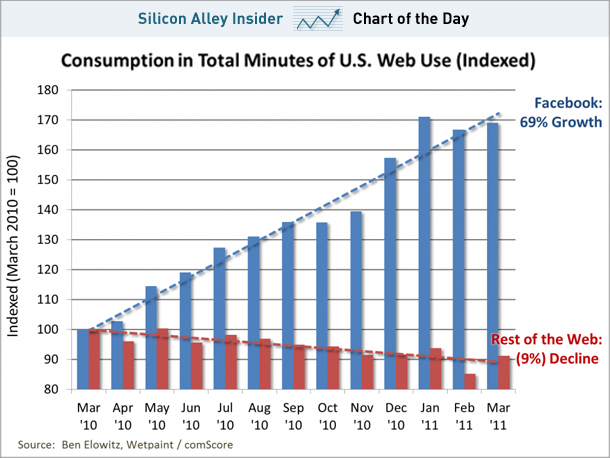 Facebook is already receiving three times more users minutes per month than Google acording to ComScore and this trend will continue. Facebook is now #1 in the advertising campaigns although competion remains fierce. Other social network platforms also struggle to catch up with Facebook although LinkedIn, Tumblr and Twitter all hit record highs in May, 2011. LinkedIn now attracts 33.4 million U.S. visitors, more than Twitter’s 27 million and Tumblr’s 10.7 million. Tumblr is the fastest-growing of the three companies though, boasting 166% growth in the last year. LinkedIn’s U.S. audience rose by a strong 58% in the last twelve months. (Source: ComScore). The once popular NING platform ceased to be a free option in 2010 and has just announced a 27% increase in its base fees for their NINGPlus subscription. This is guaranteed to turn off even more of its former users as such platforms wilt in the shadow of Facebook, LinkedIn and Twitter.